In this part of the site I'll explore some of the damage done by the cooking process. For information on why whole, ripe, raw, fresh fruits, vegetables, nuts, and seeds are the best nutritional choice we can make, read these articles. When you cook a food, you destroy many of the vitamins and minerals that make it worth eating in the first place. To be fair, anytime you process a food, including the freezing and drying process, there are similar losses. This merely shows us why whole, raw fruits and vegetables are superior to any sort of processed version of them. Nutrients can also be washed out of foods by the fluids introduced during the cooking process. Boiling a potato, for instance, will cause most of a potato's B and C vitamins to be carried off in the water. Some argue these vitamins can be recovered if you drink the water, but how usable the vitamins are to the body after they've been in boiling water is debatable. Similar losses occur when you use oil to broil, roast or fry a food and then drain off the oil. In the table below I've listed the maximum nutrient losses stemming from common food processing methods. Actual losses will vary depending on temperature, cooking time, the food in question, and other factors. As you can see, your food is severely degraded by cooking, and if you reheat your meal, you're losing even more. It's just not worth it to eat cooked food. Raw Food Nutrition - What About Beta Carotene? You've probably heard beta carotene, along with several other nutrients such as lycopene, become more bioavailable - that is, easier for the body to use - after the food they're in has been cooked. Tomato sauce is often touted as a better source of lycopene than whole tomatoes, for instance. These substances are indeed more bioavailable, but it ignores that for every nutrient that becomes more available, dozens are being degraded. Also, there's currently no way to confirm these extra available nutrients are actually doing us any good once they've been cooked. Raw Food Nutrition - What About Enzymes? Among raw food gurus, the destruction of enzymes is usually touted as some sort of trump card in the argument for raw foods. Unfortunately, banging the enzyme drum is a dead end that succeeds only in making raw food diets look ridiculous in the eyes of researchers and doctors who know better. The basic thrust of the enzyme argument goes like this: enzymes are needed to digest food; food contains enzymes; heating our food destroys those enzymes; ergo, heating food impairs digestion and depletes our enzyme reserves. Although uncooked food does contain enzymes that are destroyed by cooking, those are not the the enzymes we use to digest food, and few enzymes survive our acid digestive mediums and reach the intestines intact. Although some of the enzymes that make it through may be beneficial, we produce all the enzymes we need to digest our food, and so we need to neither supplement our enzymes with pills nor worry about the food being able to digest itself with its own enzymes. Due to the emphasis of nutritional authorities, society is pretty obsessed with eating protein. There is, of course, plenty of protein to be had from vegetable sources, but if you heat it, your body has a hard time putting it to good use. As you may know, protein is made up of amino acid chains. When cooked, these amino acids fuse together, and the overall protein structure -a kind of curling of the chains- is altered considerably. The protein can no longer perform its function, and the end result is usually disrupted cell activity or cell death. A good example of this is an egg. When they come out of the shell, a raw egg white is transparent and liquid. 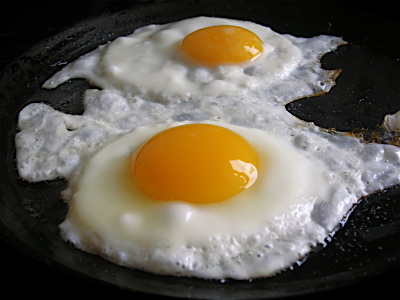 When you cook it, though, the protein is denatured and the egg turns into an opaque, solid mass. Protein, of course, is not useful in and of itself. It must be broken down into its constituent amino acids to be used by the body. The problem is that heated proteins have their amino acids fused together into enzyme-resistant bonds the body cannot fully break down. It instead partially breaks them down into polypeptides, which the body must then expel as useless. One of the byproducts of cooking grains and starches is acrylamide, which has been linked to an increased risk of cancer and is known to be toxic to the nervous system (1). The highest doses of acrylamides are found in cooked carbohydrates, especially french fries and bread. Grilling, frying, and barbecuing releases transfats and cancer-causing compounds in food, especially when it comes to animal protein (2). Read how a healthy diet will allow you in line with this raw food nutrition information. Achieve new heights with 'The Raw Food Lifestyle'. Are raw food enzymes really important? (2) Dietary carcinogens linked to breast cancer. 1993. Medical World News, May, P. 13.